A good drink always makes your guests feel special. Episode three of the podcast is up ready for a listen here. It’s can be found on most stations that host podcasts (iTunes, Google Play, Stitcher, Spotify, FM player and Soundcloud). 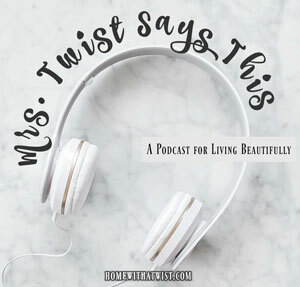 This week I shared the story of how I got my name, tips on how to support a grieving friend, how to stock a dish closet, 12 habits of happy women and a delicious recipe for Hot Golden Fall Punch. I found this recipe years ago, 30 to be exact, from the Junior League of Austin cookbook. I make it every fall when I host parties. A fun thing to try is setting up this hot punch in a percolator on your front porch with a tray of mugs. 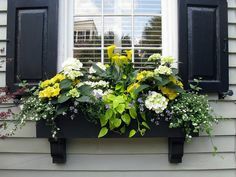 When guests arrive they will smell the spices from their cars and instantly enter your home with mug full of happiness! Pour juices into electric percolator*. Place remaining ingredients in basket and perk. Serve steaming hot. Serves 18-20. *Without a percolator, pour juices in a large pot. Simmer 10 minutes and remove spices before serving. 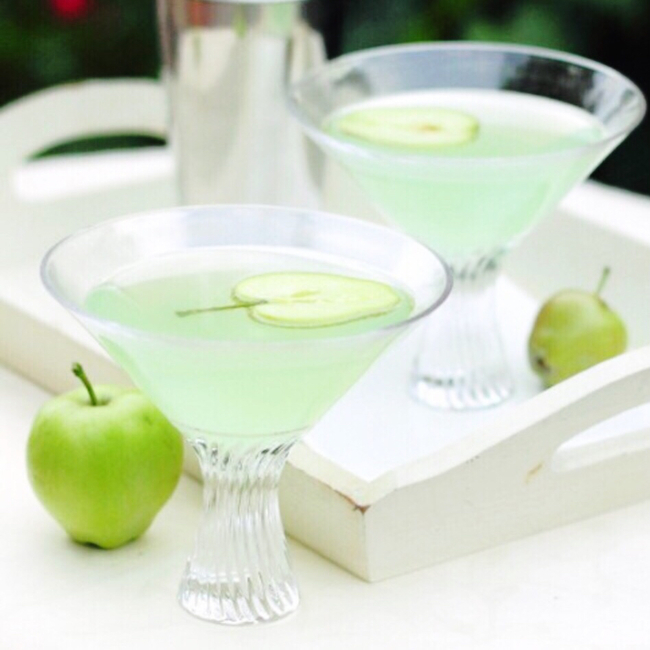 Here’s a lively twist on a classically chic cocktail perfect for a St. Patrick’s Day celebration. When crafting cocktails we love incorporating seasonal ingredients. While apples are typically thought of as a part of the fall harvest, tart green apples offer a crispness for the sunny spring days, while ginger provides a warming flavor profile for the cooler nights. Shake this cocktail up for a cozy night in or as a dessert pairing at your next dinner party. We love cocktails that are a bit more of an experience to mix up, as it makes them all the more worthwhile. However, if you’re not feeling quite like Betty Crocker, you can easily substitute a premade simple syrup alongside a high-quality store bought apple juice — it will be our little secret! To create your apple-ginger simple syrup bring the water, sugar, ginger, and peel of the green apple to a boil in a medium saucepan. Cook over medium-high heat until the sugar has dissolved. Quickly transfer the simple syrup pan to a cold ice bath, stirring occasionally. Once cooled strain the simple syrup to remove the apple peel and ginger. Place the peeled green apple into a juicer, and strain if necessary. Fill your cocktail shaker with ice and pour in the vodka, 2 ounces of the apple-ginger simple syrup, and ⅓ cup of the apple juice. Shake well, and pour into two martini glasses. Garnish with a fresh apple slice or apple peel garland. Enjoy! A few years ago I purchased some bottles of bubbly from Stacy Ricks at WineShop at Home and have been pleasantly surprised with the high quality of my selections. I like that I can shop from home for wine without being overwhelmed with the selection at the big box liquor stores. Stacy knows first-hand how her selections taste. You can even take a “Find your Vinotype”quiz on their website by answering just a few questions to narrow down the types of wine your palette prefers (I am a hypersensitive vinotype which means my wine preferences run toward more delicate, dry wines with lower alcohol levels. Reds have to be especially rich and SMOOTH for my highly sensitive sensory perception). Red: Dusk Lambrusco pairs well with savory turkey and gravy, and mashed potatoes. White: Somersville Cellars White Meritage creamy side dishes, casseroles and veggies. 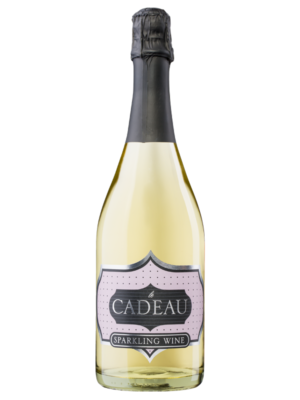 And for desserts like pumpkin and pecan pie try Cadeau Rose Sparkling wine. 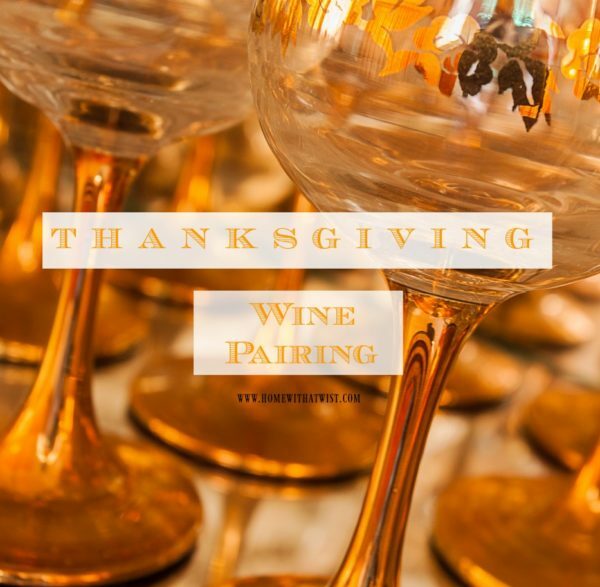 Tip: For an in depth list of pairings with other holiday foods, her website has a winemakers journal with really great entertaining tips. Click here for more pairings. 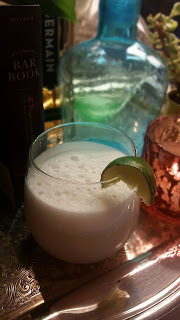 One of my favorite entertaining tricks is a welcome cocktail. It makes it easy for me because I don’t have to make a custom drink for each person affording me the chance to finish up last minute details in the kitchen. Guests can visit and sip until the full bar is open. 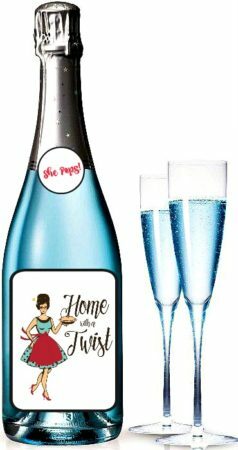 Bubbly is the perfect drink for this because it says “let’s get the party started” and makes guests feel special. Set up glasses and a wine bucket filled with ice by the front entrance and guests can help themselves or you can pre-pour each glass and have it waiting on a festive tray with fun cocktail napkins. All of WineShop wines come with a nicely formatted, heavy stock card with information about the wines, including things like vintage, alcohol content, ageing potential and most importantly, cheeses and foods to pair with that particular wine. Additionally, there is a recipe on the flip-side of the card for a suggested food pairing. Stacy recommends three different cheeses, something sweet, and something salty. The sweet could be fig preserves or chocolates or other dessert type treat. 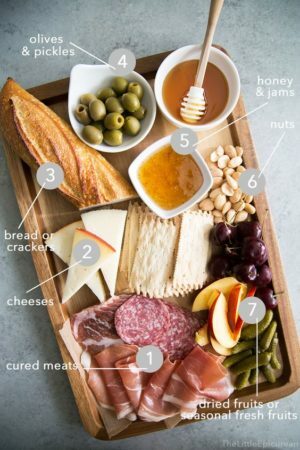 The salty could be anything from popcorn or kettle chips, to salami or nuts. Crackers with a bit of sea salt are always a great addition! 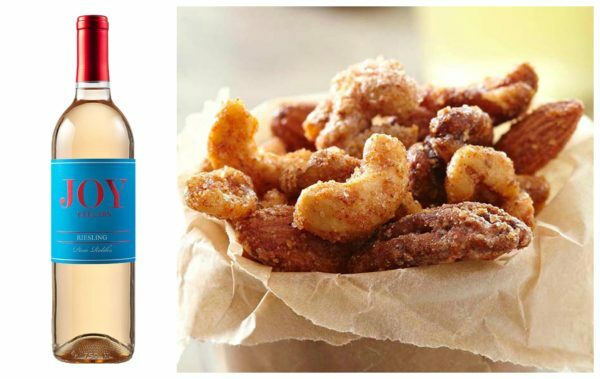 Here’s a yummy recipe for Sweet & Spicy Nuts that pairs perfectly with Joy Cellars Riesling. This would be a great gift for Christmas — fill a Mason jar with these nuts and add the wine! You know how I love brunch — I get that from Mother (see Mrs. Twist’s Guide to Thanksgiving: Breakfast Ideas here). Stacy recommends Adagio 2013 Merlot and The Fact Blush. 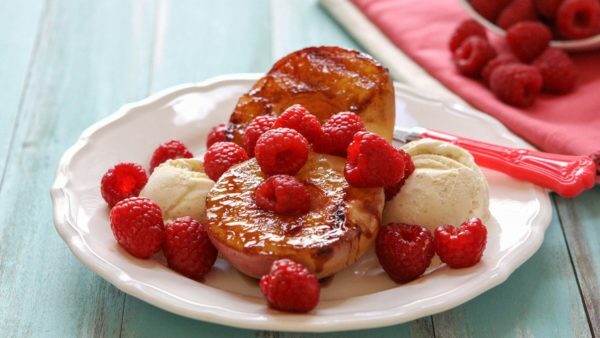 Look at this recipe for Grilled Peach Spiced Melba that pairs perfectly with it! Personalized wine! 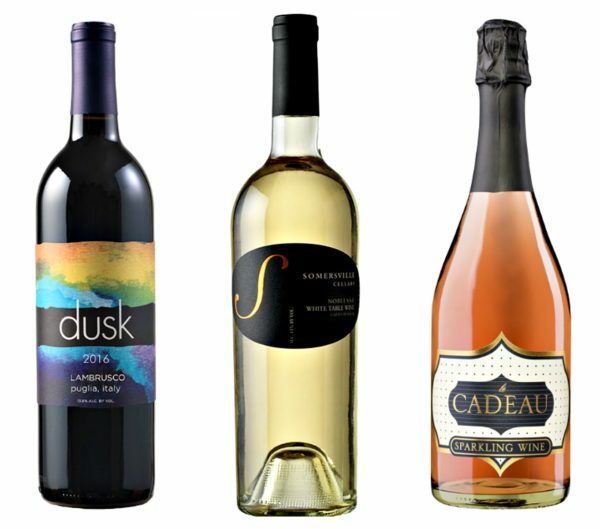 Design your own unique wine label by adding an image and personal message to one of their six different label templates. Select your favorite image from their extensive image library, or upload your own photo or logo for a truly personal touch. It’s a winning gift idea that makes for great impact and a lasting impression. Hopefully, this helps you to start thinking about getting into the Thanksgiving “spirit!” Be sure to reach out to Stacy at [email protected] or through her website for questions or to place an order. Thanksgiving orders must be placed by November 15. Note: I was not compensated for this post. I’m just a fan of good wine. 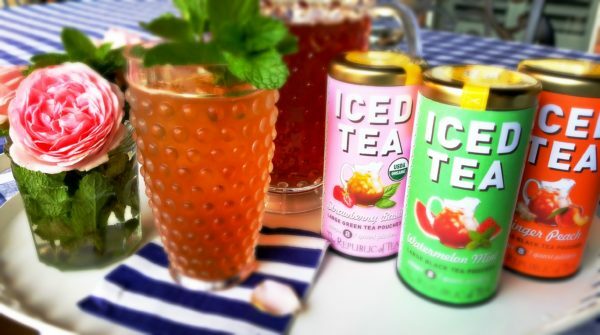 Give me a Tea: Refreshing flavors for Summer! I drink unsweetened iced tea everyday — all day long! 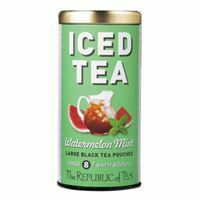 I’ve been an iced tea drinker since way back, and even though I am a Southern girl, sweet tea is not my thing. 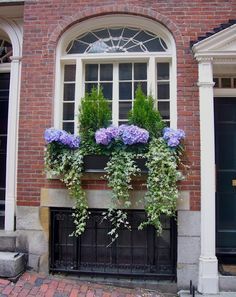 Add a spring of mint and a lemon slice and my heart sings! My sister-in-law was asking me recently for some ideas on refreshing non-alcoholic drinks for the summer. 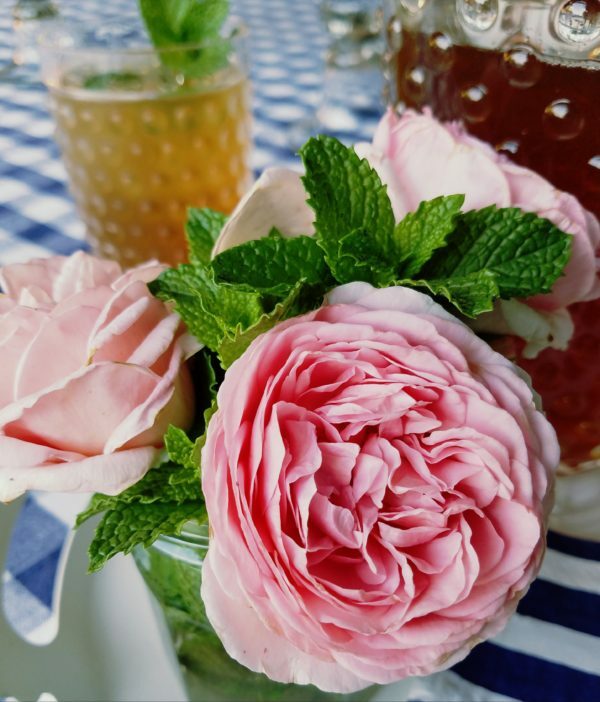 Although, I have 415 recipes on my Pinterest “Just a Sip” page, it is much easier to find a flavored tea and no need to buy a bunch of ingredients to add to the expense. An added bonus — black tea has many health benefits. About a month ago, I signed up to receive a series of Tea: 101 emails from the Republic of Tea on how to brew the perfect cup of tea. I perused their catalog and ordered three tins of tea to try. Organic Strawberry Basil Tea. This is my new favorite. You can definitely taste the strawberry, but not in a sweet way. It’s subtle. There’s an essence of basil, but just enough. 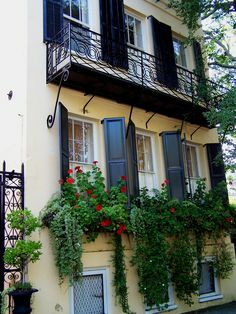 This would be perfect with for a ladies luncheon with tea sandwiches. It’s fresh. Watermelon Mint Tea. It was a little overwhelming at first, very watermelon-ey. But once I drank the first glass, it was different in a good way. I liked the taste of the mint. I can see a pitcher of this poolside. Add a wedge of watermelon on the edge of the glass and it will be impressive. 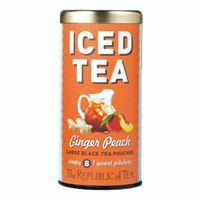 Ginger Peach Tea. It’s always my fall back tea. My favorite place to get this is at McKinley’s with a chicken salad sandwich. It will always be in my pantry, but I am glad I tried the other two teas. Fill a kettle with cold water and let it come to a boil. Meanwhile, put two bags of flavored tea, and three bags of Lipton tea into a large heat-resistant bowl measuring cup (like a Pampered Chef Batter Bowl with a spout). Before I put the tea bags into the bowl I fluff them up so they aren’t flat. I think this allows the water to flow through the tea leaves. 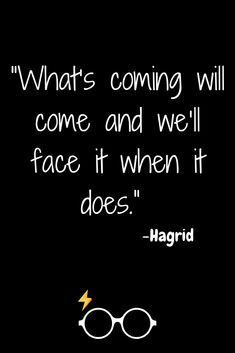 Pour boiling water into the bowl and I let it sit on the counter until it is cool to the touch. I like really strong tea so I leave the bags in until I dilute with water. I pour it in a gallon sized plastic jug and fill with filtered water. I always have a gallon of tea in the door of the fridge at all times. The other thing I always have on-hand during the warm months, is a jam jar full of fresh mint from my garden. 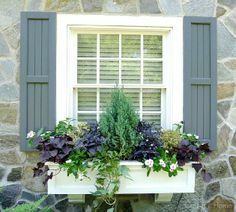 Mint thrives in our Texas heat and humidity. Be sure to visit The Republic of Tea site. There are tons of other flavored teas to try — like Blackberry Sage — and lots of great information like 25 Fun Facts about Republic of Tea. Did you know it was founded by the same people that founded Banana Republic? And, they were the first company to receive USDA certified organic certification. What’s your favorite summer sip? Please share! 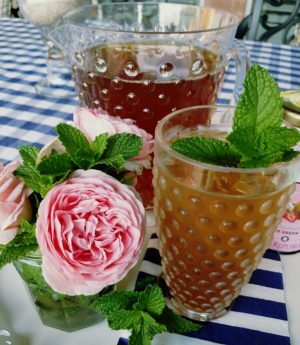 Author Melissa Austin-WeeksPosted on June 27, 2017 June 26, 2017 Categories Just A SipTags flavored teas, how to brew the perfect iced tea, republic of teaLeave a comment on Give me a Tea: Refreshing flavors for Summer! On the coat tails of Holley’s post yesterday, I thought it would be fun to round up some pink drinks. 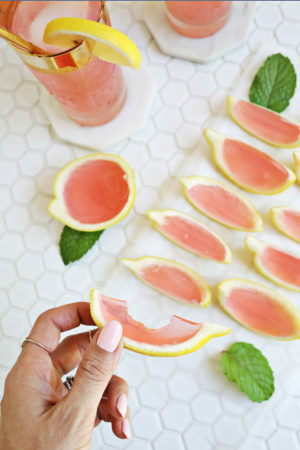 From A Beautiful Mess, look at these Pink Lemonade Jello Shots! They give you a recipe for “lemonade” using vodka, pink lemonade, unflavored gelatin, and Deep Eddies Lemon Vodka. Yum. But, you might be able to concoct a non-alcoholic version with plain lemonade and gelatin. 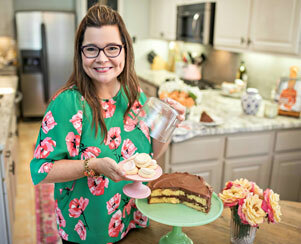 In fact, if you need a kid-friendly pink lemonade recipe, here is one from The Cooking Bride. This is the kind you make using a simple syrup on the stove and mix in fresh squeezed lemon juice, then add a smidge of cranberry juice to make it pink. Central Market always has the freshest selection of lemons. Meyer lemons are my absolute favorite for making lemonade. 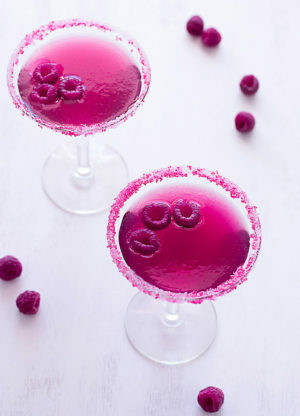 Look at this confection…Very Pink Raspberry Cosmopolitan from Creative Culinary. That luscious pink color is divine! Calling for raspberries and their juice and raspberry liqueur, vodka and simple syrup, garnished with a rim of pink sugar crystals…it makes me want to sit on a recliner and be fanned by a cabana boy holding a palm frond. And last, from Tell me Tuesday, a Rosemary, Grapefruit and Gin cocktail. 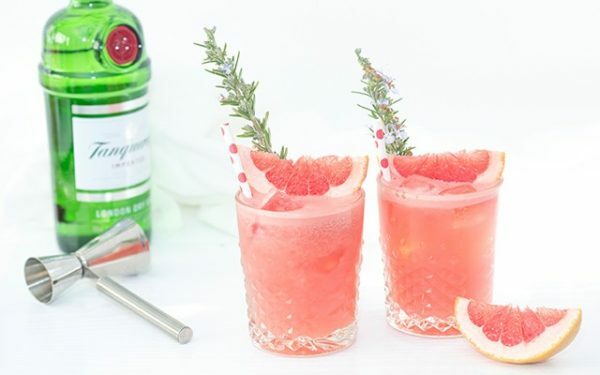 You make a simple syrup using rosemary, then add in dry Gin and fresh squeezed grapefruit juice. Here’s a tip: If you are going to prepare drinks that call for “fresh squeezed” purchase the juice from a place like Central Market that really makes it fresh and not from concentrate. Don’t use canned juice. I mean, you can, but the result of a super-fresh cocktail that tastes clean won’t be the same with juice from concentrate. Trust Mrs. Twist on this. If you don’t know how to make a simple syrup, you need to learn. It’s not hard. Here’s a how-to video link here. It will keep in the fridge for up to a month. Just put it into a mason jar and it will be ready for whenever you want to whip up one of these delicious cocktails. 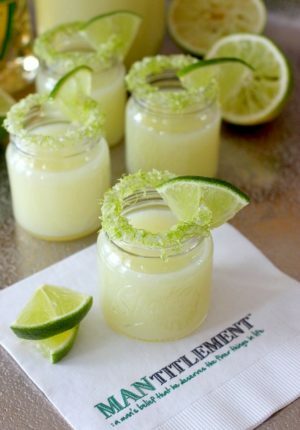 Check out my other Just a Sip cocktail ideas on my Pinterest board (there’s over 300 recipes). Cheers to Pink! Nothing says “Party!” like yummy sips from a percolator. It’s the quintessential drink for any awesome gathering. Mother always had a coffee urn in her entertaining arsenal ready for all the parties she hosted. I’m on a personal journey to keep punch recipes alive and well. 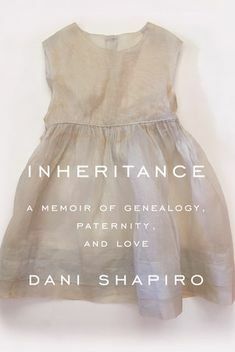 It’s not just for baby showers and wedding receptions. 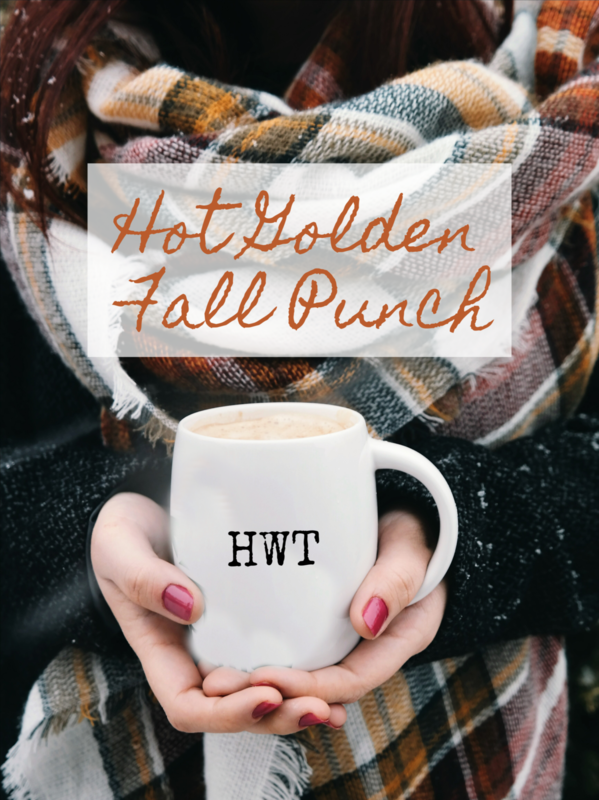 In honor of National Punch Day, I am sharing two of my very favorite hot punch recipes; one for fall and one perfect for Christmastime. First, every hostess needs an electric coffee urn. I have one of these in my party pantry. They are perfect for making coffee, hot cocoa or iced tea for a crowd. I throw the ingredients into the basket and in 20 minutes your hot punch is ready for your guests. Places like Target and Walmart sell them for about $40-$50. Pour juices into electric percolator. Place remaining ingredients in basket and perk. Serve steaming hot. (without a percolator, pour juices in a large pot. Simmer for 10 minutes. Remove spices). Pour first 3 ingredients into a large percolator. Place brown sugar and remaining ingredients in percolator basket. Perk through complete cycle of electric percolator. Yield: 1 Gallon. I have a table on my front porch with an outlet nearby. 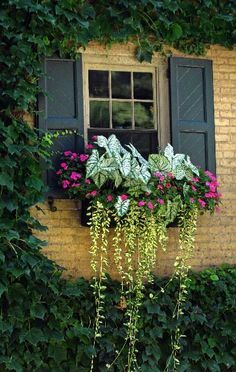 I love to set up my percolator on the porch with fun mugs and a sign for guests to start with punch when they arrive at the door. 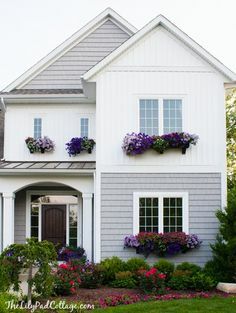 They can smell the spices as they walk up to the porch and it’s so welcoming! It’s different, unexpected and a special touch your guests will not forget. Cheers! Today is National Tequila Day. Other than your usual Margarita, I took a spin at the Pinterest wheel and found three fun sips to celebrate the day with a good bowl of salsa and salty chips. Sip one, Lime Drop Shot, is from ManTitlement. A fun cooking and entertaining blog from a guy’s point of view. Second Sip, a Tequila Sunrise. It reminds me of the 60s when cocktail hour was everyday before dinner. And, who doesn’t love an umbrella in the their drink garnished with maraschino cherries! This recipe is from Averie Cooks. 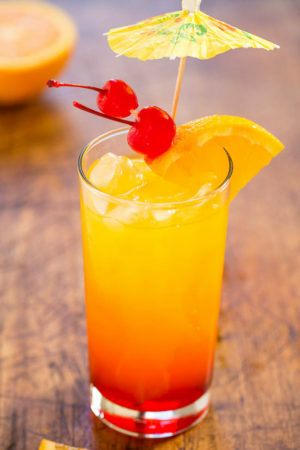 I found some fun things on the web about the origin of the Tequila Sunrise…one story said a fellow named Gene from the Arizona Biltmore worked for the hotel over 30 years and one of his many talents was bartending. He loved creating the perfect drink for each guest. One guest asked Gene to make a cocktail with tequila so he’d have a refreshing pool-side beverage. Gene’s concoction was a little different than the one I shared. His recipe had the addition of Creme de Cassis and lime juice. Fill glass with cracked ice. Add one jigger Cuervo Tequila, one teaspoonful grenadine, 1/3 teaspoonful cream de cassis and the juice 1/2 lime & sparkling water. Third sip, is the Paloma from BuzzFeed. I love, love, love grapefruit juice. 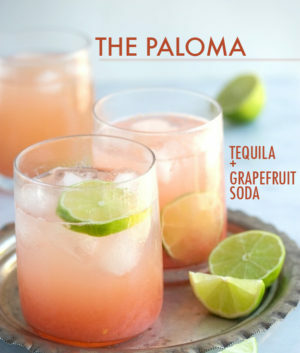 It’s a simple drink with a few shots of tequila topped off with icy, cold grapefruit soda. Have a super Saturday with your sips and chips! 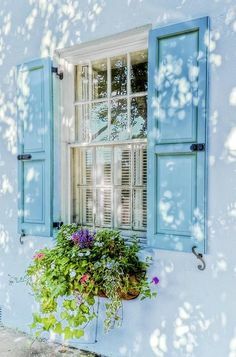 I follow Coastal Living magazine’s Instagram feed. They featured the yummiest cocktail for a Coconut Mojito that I had to try. It tastes like a suntan in a glass. 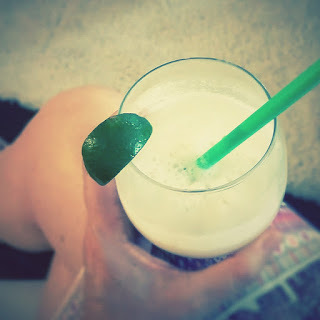 Remember the days when Pina Coladas were all the rage? Well, this is her younger, hipper sister’s drink. 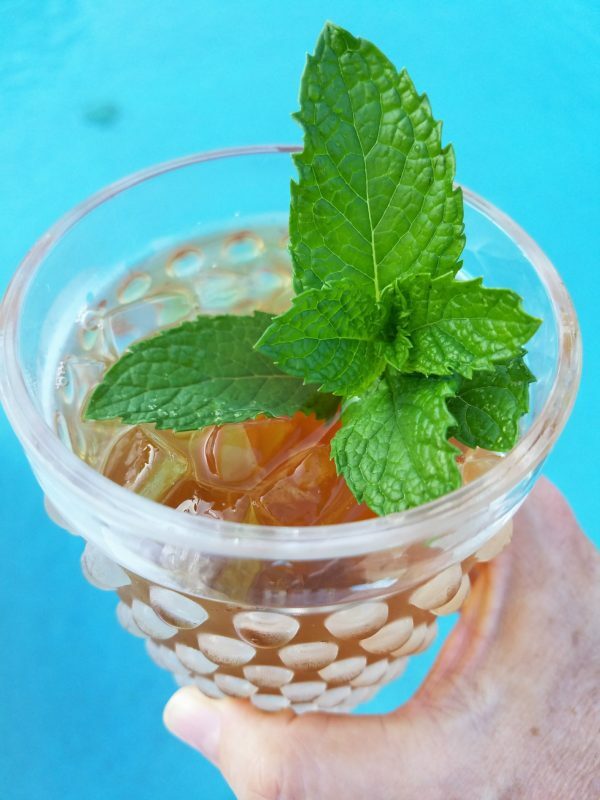 Here’s the link to the recipe at Coastal Living where this liquid treasure and other fun cocktail recipes can be found. I’ve provided the recipe from their site below. Muddle 6 fresh mint leaves, 3 lime wedges, and brown sugar in the bottom of a cocktail shaker. Add white rum, coconut rum, and cream of coconut. Fill shaker with ice, and stir vigorously until chilled. Strain mixture into a tall glass, and top with chilled club soda. Garnish, if desired. 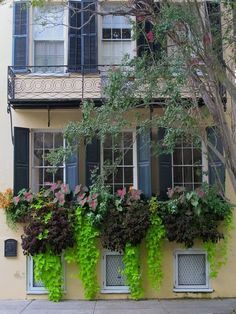 Check out my Pinterest board for some other sips, too. 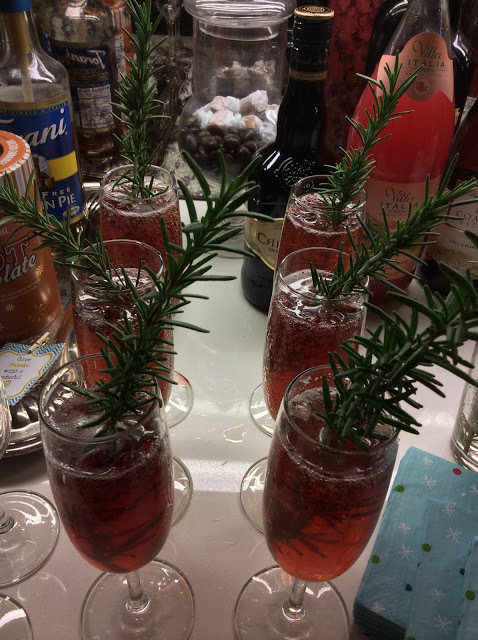 We hosted our neighborhood Christmas party last week and I searched Pinterest for a fun cocktail. I found one I liked Pomegranate Rosemary Spritzer from House in the Hills. We have a huge rosemary bush in our backyard and I really liked the different ingredients, especially the addition of homemade rosemary simple sugar. I renamed mine a Mrs. Claustail (get it instead of Cocktail, it’s Claustail? What? I think it’s clever). I had a tray of these bubbly spirits waiting for guests as they arrived. The sprig of rosemary is like a swizzle stick. Grocery stores are plentiful right now with Pomegranates and I like to have a bowl of them on our kitchen table during the holidays. Mr. Bee is a whiz at peeling them and plucking the fresh seeds of goodness. Plus, we needed them for Giada’s Pomegranate Brussels Sprouts Salad. Add 1 cup of water to a small saucepan with 2-3 sprigs of rosemary, bring to a boil. Remove from heat, strain rosemary sprigs and set aside to cool. Pour Prosecco into 4 cocktail glasses. Add 1/2 ounce of peach schnapps, 1/2 ounce rosemary simple syrup, 1 tsp. lemon juice, 1 ounce of pom juice and a splash of mango soda water to each glass and stir. Sprinkle in a few pomegranate seeds into each glass. 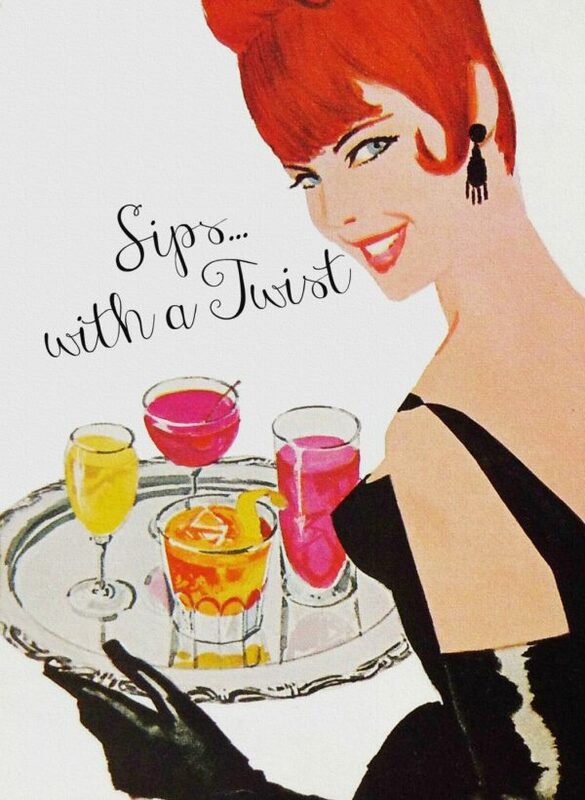 Check out my Pinterest — Just a Sip board for more ways to say Cheers! 3 parts Blood Orange Juice (no fear, there is no blood involved. It’s a type of orange that makes a lovely shade of dark reddish orange). You can use either fresh juice or ready made. 1/2 part simple syrup or agave nectar. For the party he made the simple syrup which is one part sugar, one part water simmered on the stove. He added a few sprigs of fresh mint and let the mint steep in the syrup. That was my favorite version. If you have the time, I recommend this step. Chill the ingredients and pour over ice. We prefer on the rocks, but you could also freeze it.